If you’re in the USA, you’ll dial a U.S. access number while participants in Estonia will dial an Estonia access number. Located in the Baltic region of Northern Europe, traveling to Estonia from the United States isn’t necessarily practical. Whether you’re closing a business deal or collaborating with partners in Estonia, you may want to consider chairing an Estonia global conference call instead of making the trip across the Atlantic. Why Hold Estonia Global Conference Calls? Obviously, holding a global conference call will cost you much less than booking airline tickets, reserving a hotel, and arranging for local transportation once you arrive. While saving money is a major benefit, it’s not the only one. For example, you can bring together a much larger team if desired in a group global call. Moreover, you can hold as many Estonia global conference calls as needed to complete your project. In fact, you could hold a series of shorter, more focused conference calls on a weekly basis, allowing you to make greater progress and build long-term relationships over time. Not only that, initiating and participating in these conference calls is easy — both for you and for your participants. You can schedule Estonia conference calls at any time, day or night. There’s no need to make a reservation, and our 24/7 live US-based operators are readily available to help you in any way. You can also hold Estonia conference calls on the fly. The only special equipment required is a phone. Any phone will do, and everyone already has access to one. Your participants in Estonia — and countries around the world — will be able to dial a local or toll free access number specific to their own country. If you’re in the USA, you’ll dial a U.S. access number while participants in Estonia will dial an Estonia access number. You can record your group audio calls and then share the MP3 recording if desired. Advanced features and tools are available to further enrich your international conference calling experience. We offer toll free Estonia international access numbers and a Tallinn, Estonia access number under our Expanded conferencing plan. 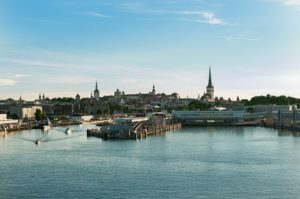 Your callers in Estonia do not need to dial an international number or incur costs associated with the conference call. Our pay-as-you-go Estonia conferencing plan features low per minute rates from Estonia and more than 100 other countries. You are billed only for the minutes used, and there are no surprise charges like monthly fees, minimum usage fees, cancellation penalties, penalties for non-use, etc. Plus, you don’t even need to sign a contract. Whether you need to host a single Estonia conference call or dozens of them, you will only pay for the time spent conferencing. While traveling to Estonia to meet with colleagues, business partners, and others may be necessary every now and then, global conference calls are a good way to fill in the gaps and build a shared history of communication and collaboration. Sign up for our Expanded plan today and start communicating internationally right away.